Back in the day, when I was younger, Cabo San Lucas was the place to see and be seen on spring break and after graduation. Having grown up in San Diego, it was an easy destination to get to and an even easier destination to afford. A lot has changed since I was a kid. As I grew up, so did Cabo. 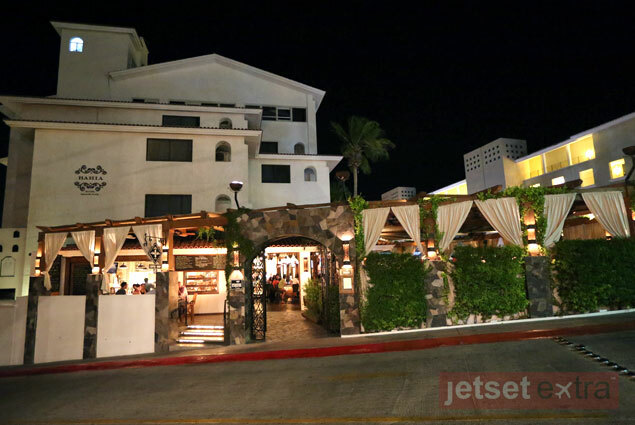 Though still a very easy destination to travel to and easily affordable for most, Cabo San Lucas now has some great new hotels and a gorgeous new marina with tons of shops and restaurants. Jason and I stayed at the Bahia Hotel while in town and discovered this corner property isn’t just a hotel, it’s where the relaxed atmosphere of Baja collides with the urban chicness of a Southern California city such as Los Angeles. 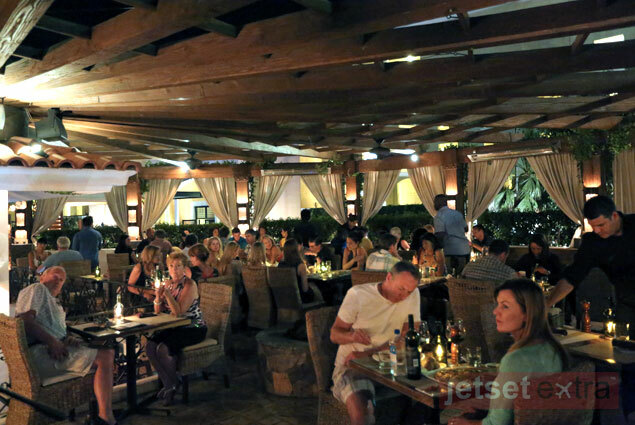 What you end up with is great food and drinks in an entertaining atmosphere and a group of people who are not pretentious and just want to have a good time. This hotel offers so much for its guests; I was pretty floored. As a boutique-style hotel its offerings far exceed expectations. Let’s begin with the food and drinks. Bar Esquina is unique to this destination as it has an eclectic mix of cultural influence on its menu. We met up with chef Rogelio García, who is internationally trained and also influenced by his mother and grandmother. His menu design offers a little something for everyone, with samples of cuisine from Peru, Mexico, Baja, France, and Italy. 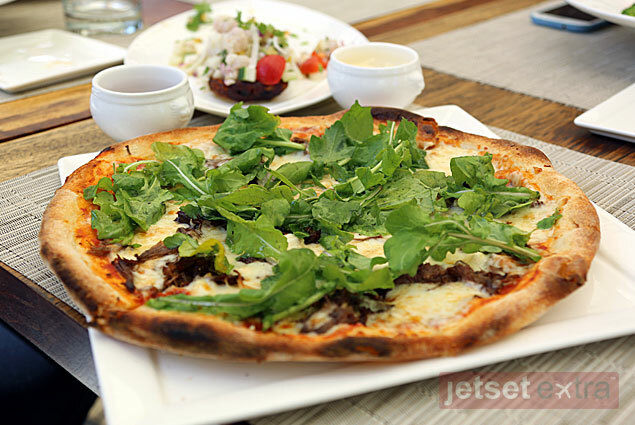 Make sure you try the short rib pizza, the ceviche, and the tuna tartar. The burger is huge and full of mouthwatering flavor; it shouldn’t be missed. The bar in the restaurant is where all the cool kids in Cabo hang out at night. It’s full of fun-loving people and live music—and the drinks are flowing. If you don’t make a reservation for the restaurant or get there early, the bar will be full. A reservation is highly recommended, though I’m sure if you get there and a table isn’t ready you could saddle up to the bar and order a plate and a great cocktail. This venue does not fall into the average Cabo bar category. These bartenders have mad skills and don’t fool around when making a drink. We sampled some of the amazing cocktails and yours truly did a little mixology class, learning how to make a Cabo Caliente and a Caddy Margarita with our new favorite bartender, David. Guess what’s going on my summer cocktail menu at home? 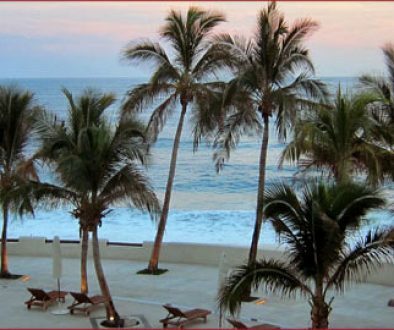 Mornings are especially wonderful at Bahia. The resort has its very own coffee bar, which is perfect for those mornings after drinking fabulous cocktails all night with the new friends you just made at the bar. The coffee bar doesn’t just have coffee and pastries, the coolest barista, Sheila, works there, too. This girl was so much fun and very talented. She made me my very own Hello Kitty coffee. 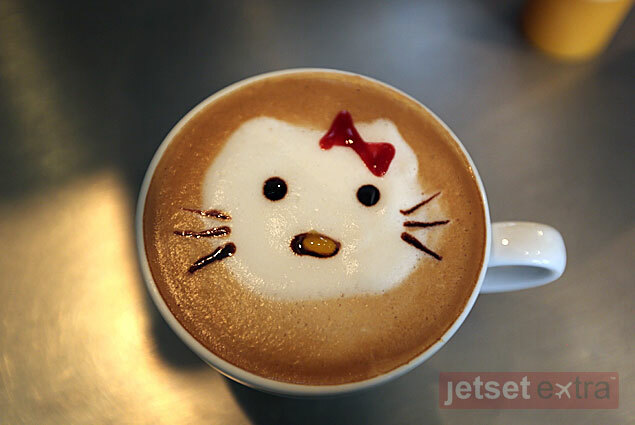 Yes, it was a caffé latte with Hello Kitty on the top! I was blown away with the talent this girl has, making an average caffé latte into a work of art. Jason and I love to do activities while we are traveling, and lucky for us the Bahia also offers a very wide array of activities, from super crazy adventures to a relaxing seaside round of golf. Jason and I decided to sample a bit of everything. What the heck? At sunset the second night we were in town we thought we’d take an ATV ride along the beach. About 30 minutes from the Bahia is a great park called Rancho Carisuva. Here you can ride four-wheel ATVs or buggies or go for a leisurely horseback ride on one of the 44 horses they have at the ranch. 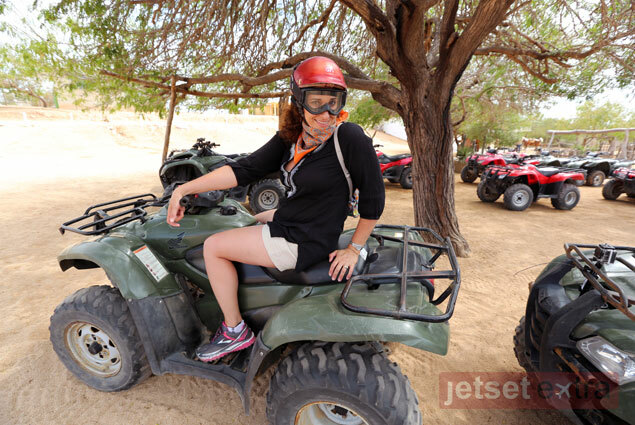 We had a blast riding through the desert and the cactus plants, ending up on the pink sandy beach along the water. It was really a great and easy activity for the end of the day. 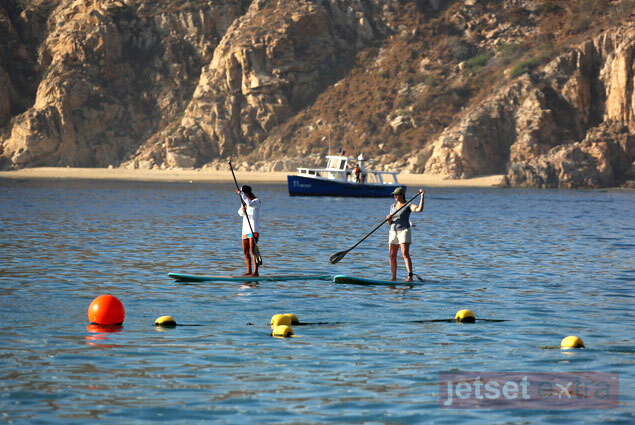 Our first activity the next day was stand-up paddle boarding at Cabo SUP with the cutest, coolest girls on the beach, Lizzy and Shey, the paddleboard instructors and tour guides. These girls had me up and paddling within two minutes. I had such a great time learning to turn and maneuver my way through the bay. Once I had my paddle boarding legs we loaded up the boards and snorkel gear and headed out by boat across the bay to Lovers Beach and Divorce Beach, where the Land’s End Arch is. The water was a bit rough so instead we decided to head to Pelican Rock, where a small beach was waiting for us to snorkel and paddle until our hearts were content. I didn’t really want to leave, but we had loaded our day with other fun things to do so, after a couple of hours, we headed back with the girls and set off for Wild Canyon Adventure Park. This place is not for the faint of heart. 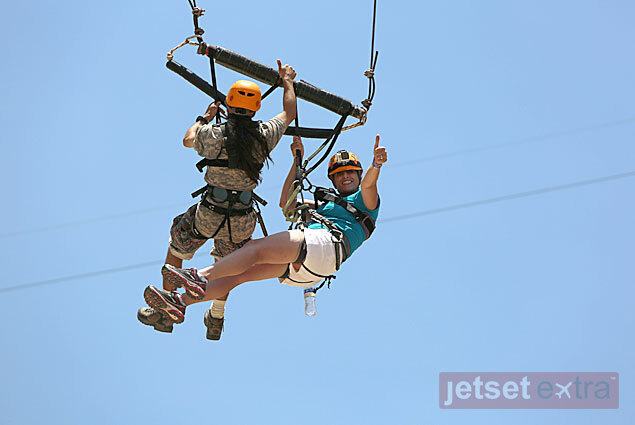 Activities range from zip lining to bungee jumping off a glass-bottom gondola into a canyon. I chose to participate in something called the Sling Swing. What madness was I about to get myself into? The swing takes off from the same glass-bottomed gondola, which sits about 230 feet above the ground. I was harnessed up and attached to a cable just outside the gondola, very gracefully seated on the edge, and eased out to midair in my harness. On the count of one, two, three, I was released. SWOOSH! I free fell for about four seconds before the swing caught and whisked my partner and me through the canyon at a very fun and exhilarating 75 miles per hour. I would love to say I didn’t scream and was totally in control, but I can’t. I even held my breath for a moment during the free fall. BUT the experience was one I would totally do again. After I regained my balance and my adrenaline stopped coursing through my body we packed up and headed out for a more relaxed activity: golf. Golfing in Cabo San Lucas is quite popular, and the course we were on was gorgeous. Instead of just offering golfers the green, grassy fairways of a normal course, Cabo Real golf course integrated the natural surroundings of Baja: cactus, desert plants, and sandy, rocky landscapes. It was very beautiful, and the back nine gives golfers a great view of the ocean. After the Sling Swing it was a welcome and relaxing way to end the afternoon. Exhausted and with so much packed into our day Jason and I headed back to the Bahia to have a late lunch and relax along the water at the Beach Club where Cabo SUP is located. A couple of beers and some fresh guacamole and grilled fish hit the spot. Cabo SUP was on the last day of its second annual Paddle to the End event, and Jason and I were just in time to watch the last of the three races being held. Paddle to the End is a great community-focused event designed to bring awareness to the area and promote non-motorized water sports. Paddle boarders from around the area enter and race three races, ending with the Paddle to the End where entrants paddle a course designed to take them to the Land’s End Arch and back to Medano Beach. 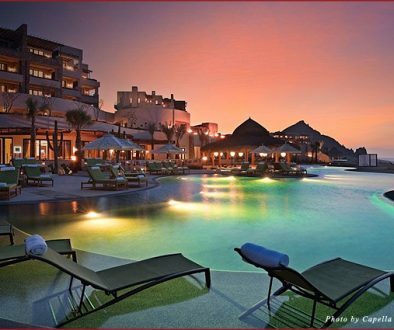 If you’ve never been and don’t know the geography of the Baja Peninsula, Cabo San Lucas is located at the very tip so it makes for the perfect venue for this event. 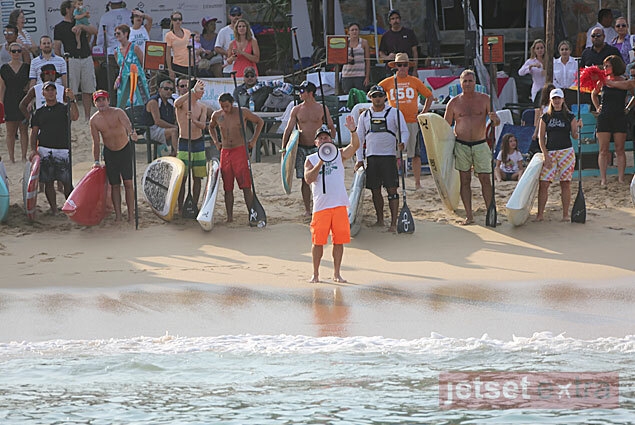 Next year the hope is to attract quite a few international paddle-board enthusiasts and perhaps some professional water sport celebrities. We had a great time in Cabo San Lucas, it brought back some great childhood memories for both Jason and I, but it also allowed us to make some new memories as well as a few new friends. I’m heading back again soon with some girlfriends, and I can bet it will be a whole different experience.